Experience old favorites with this collection of psalms and songs presented with a distinctly American flavor from Timothy R. Smith. Blessed Assurance is a collection of nine psalm settings and five hymns that candidly embraces the concept of "Americana," music that embodies American history and culture. Timothy R. Smith has taken selected psalms and traditional American song texts like "Blessed Assurance" and "I Sing The Mighty Power Of God" and set them to new melodies. This collection also includes Tim's original composition "Voice Of Christ." Frances Brockington's prodigious talents as a soprano are well suited to Tim's music. She was featured in Tim's psalmody collection With the Lord, and she is the principal cantor on Blessed Assurance. This collection is stylistically varied; some songs are reminiscent of old-time, full-choir Gospel, while others have a distinctly rock-and-roll rhythm. Like the American culture that inspired it, Blessed Assurance is strong, independent and diverse, perfect for parish or private listening. 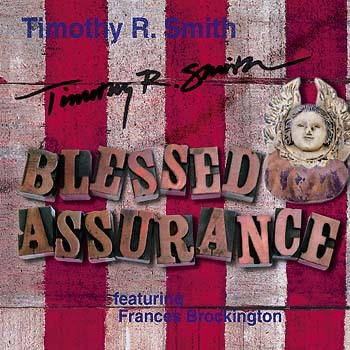 Mixing old favorites with original compositions and bringing it all together in a style that wholly embraces Timothy’s all-American roots, Blessed Assurance is a one-of-a-kind collection of songs that is equally welcome in Mass or at home. By using familiar texts like “Blessed Assurance” and “I Sing the Mighty Power of God,” along with several psalms, and setting them to new melodies, Timothy has created a collection that embodies American history and culture through music with a mix of old-timey Gospel and classic rock and roll. Beautifully supported by Frances Brockington’s prodigious vocal talents, these songs provide a wonderful soundtrack to your everyday life while also serving as wonderful additions to liturgies and non-liturgical celebrations alike. Like the American culture that inspired it, Blessed Assurance is strong, independent and diverse; perfect for parish or private listening; and an excellent addition to any contemporary Catholic music library.